One of the first things I learned about being a better Dungeon Master is the importance of preparation. Your game will run smoother if you get your minis and maps ready ahead of time. But there’s more to it than that, as I mentioned in my reflections on running Cairn of the Winter King. A good DM is well organized, too. 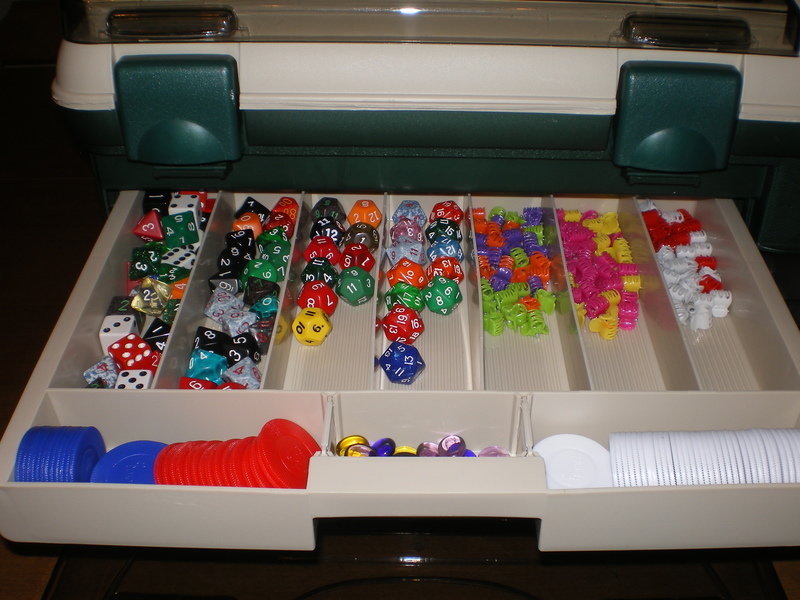 You need a good way to keep all of the dice, minis, handouts, and other gaming stuff sorted out and easy to find at a moment’s notice. I call my solution to this problem “the D&D Box”. 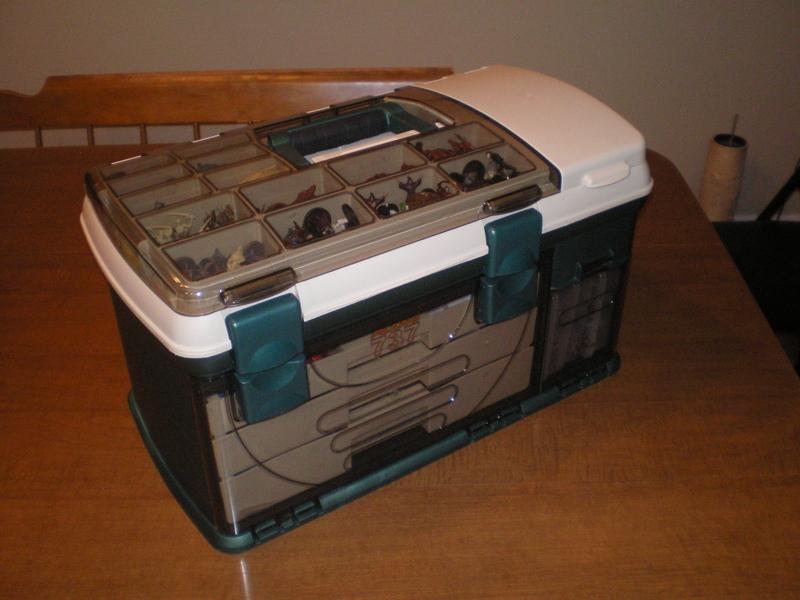 It is a Plano Model 737, originally intended as a fishing tackle box. I purchased this at my local Wal-mart for around $40. Dollar for dollar, it is the best purchase I have made for my D&D game yet. I thought it might be a good idea to share how I have all the stuff organized inside, so let’s take a closer look. The very top of the box has a clear lid covering fourteen small compartments. These are the perfect size to store my collection of D&D minis. Admittedly, this collection is rather small compared to others, and it already threatens to outgrow the box. 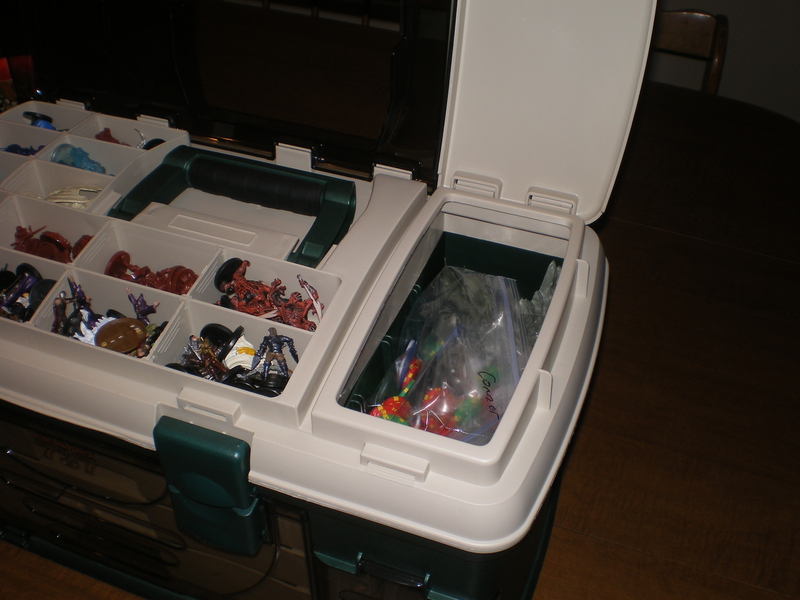 Still, you can store four or five medium sized minis in each compartment. That’s plenty of minis to have on hand just in case. I keep only generically useful minis in this areal; the specific minis used for the evening’s session are kept in the drawers below. To the right of the minis is a lid that opens up into a deeper area. 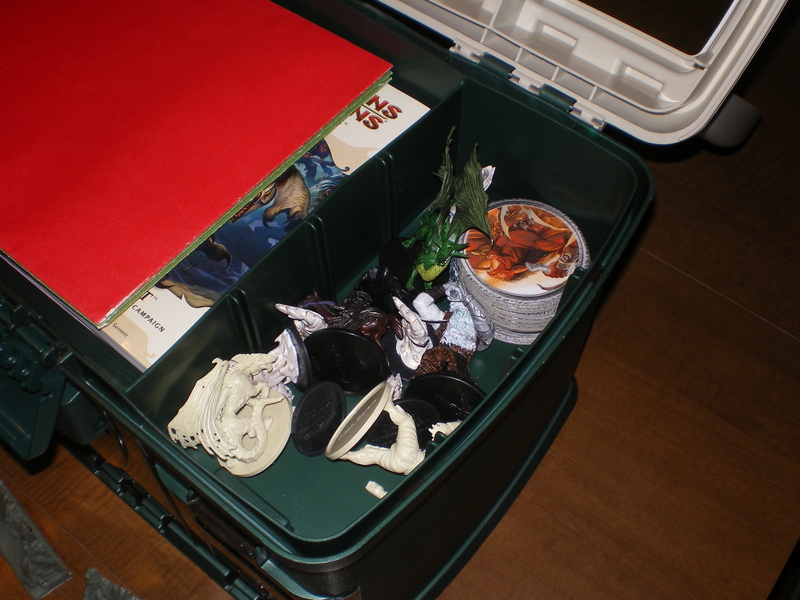 Larger minis, tokens, and other bulky items are stored here. This larger section is accessible without fully opening the latches, which is definitely a plus. The entire top section, minis and all, swings up like a lid once the top set of latches is released. Large, relatively flat items like books can be stored in this section. I did have to modify this section a bit, removing a divider molded into the plastic, just below the left hinge. 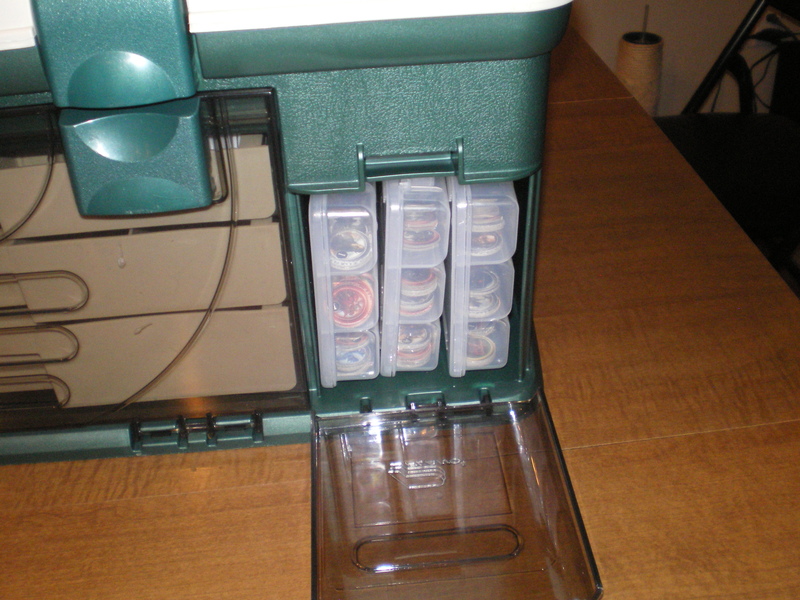 (These dividers were there to hold another Plano box, which wasn’t included.) On the right hand side, you have full access to the large minis area. This is everything I had stacked in the large flat area: three folders containing PC character sheets and handouts, two Essentials reference books, the deluxe DM screen, an adventure, a map, and some homebrew notes. There is easily enough room for more, but this is all I needed for one session. In the deep compartment on the right, you can see a few baggies. These contain poker chips of various types, used by my players to represent action points, “awesome points” (which I need to write a post about), and gold pieces. Removing the baggies, you can see how much room is available in this deep compartment. All of the huge tokens from the Monster Vault set, plus a good variety of large minis, fit in here easily. Huge minis fit, as well, but obviously you won’t be able to carry as many. There’s plenty of space to keep any bigger stuff like terrain pieces, Heroscape hexes, and the like. This set of drawers is probably the best part of the entire D&D Box. 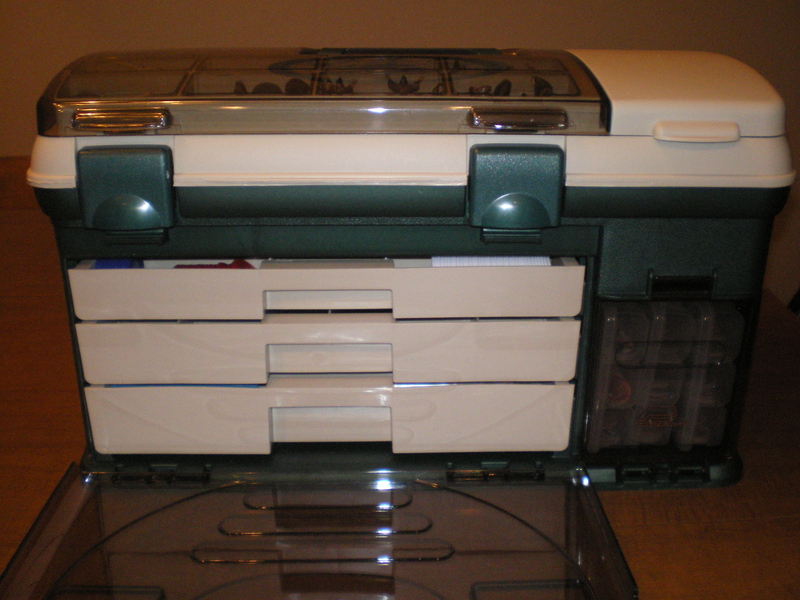 Many Plano tackle boxes stick smaller boxes in this space, but the drawers are much better in practice. A separate set of latches keeps them in place. The three drawers don’t slide out all the way, but are easy to move around and deep enough to hold all sorts of stuff you need at your table. The only thing that bugs me about these drawers is that the clear plastic cover, when opened, prevents the bottom drawer from fully opening unless you move it to the edge of the table. It’s not a huge issue, but probably worth mentioning. 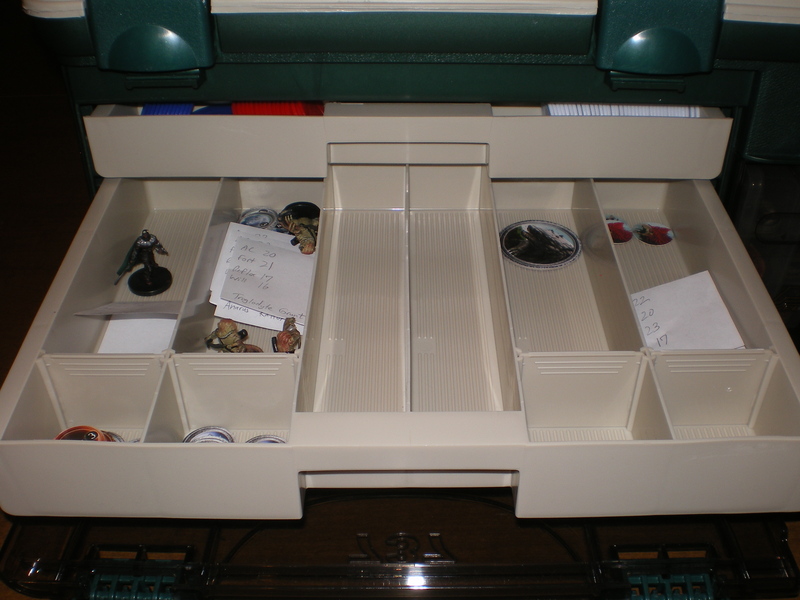 This top drawer is full of stuff, and is the one used most in play. A large assortment of dice takes up four rows, while the mini hair clips we use for condition tracking take up the remaining three. Large poker chips, as mentioned above, fit snugly in the front section. I also carry a few glass beads in various colors around, which are useful to denote difficult terrain, special areas, or whatever else comes up in play. I use this drawer to keep all the items I’ll need for each encounter together. It looks almost empty in this picture, but that’s because the adventure we were on didn’t have very many encounters. Each row here contains the minis, tokens, and hanging initiative trackers needed for each particular encounter. Having all these things available at a moment’s notice made a huge difference in how smoothly our games ran. 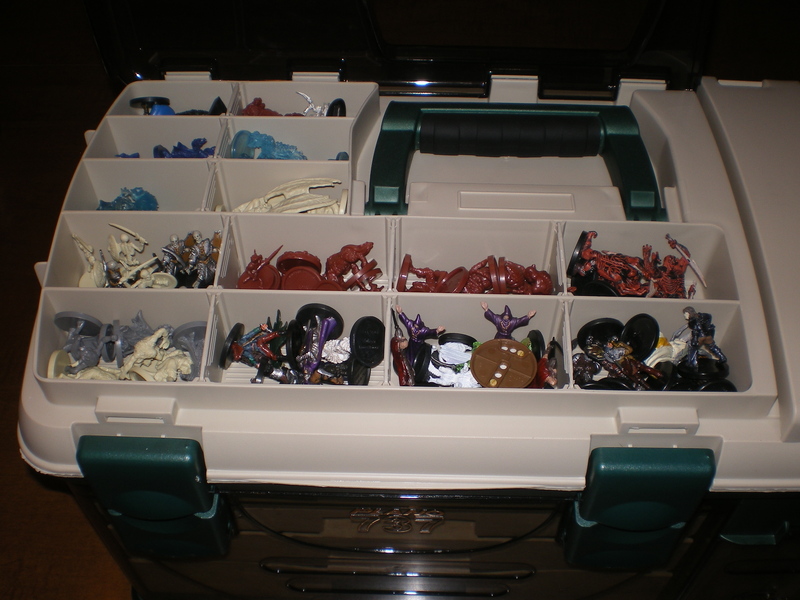 The drawers are deep enough that medium sized minis can stand up, and large sized tokens can fit without problems. Bigger minis and tokens can be kept elsewhere in the box. This is pretty much the “junk drawer” of the D&D Box. On the left are the cards that came with the D&D minis; I’ve not used them yet but since they can be used for stat blocks, I keep them. Underneath are condition tracking cards, in penny plastic sleeves, and several mazes I hand out when the thief tries to pick a lock. 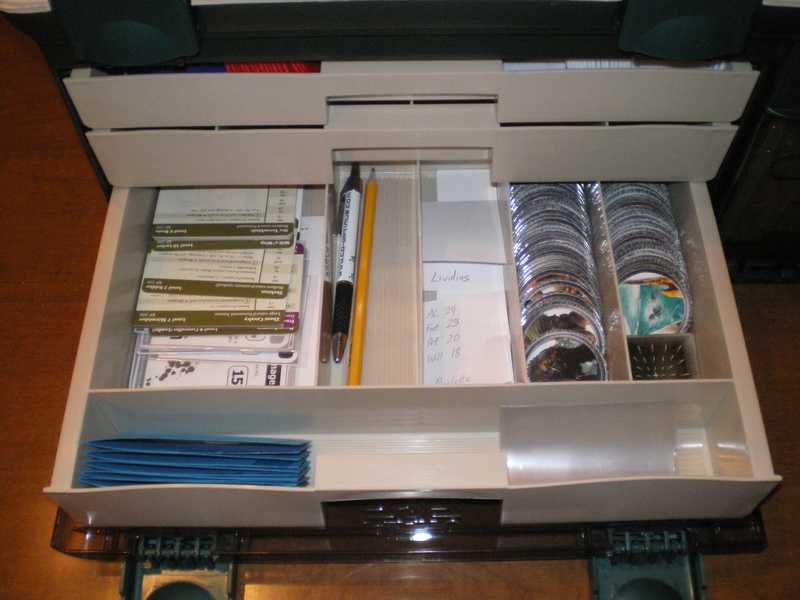 Pens, pencils, extra initiative trackers, and all the large tokens from the Monster Vault round out the drawer. The blue papers in the front section are the PC’s initiative trackers, made from thicker cardstock. The last section of the D&D Box is a small area sized perfectly to hold three Plano boxes. These boxes were included in the set. They are ideal for holding medium sized tokens. As you can see, there are nine sections in each box, which makes 27 separate divisions. I decided to organize the tokens alphabetically, just like they are in the Monster Vault. Some letters not represented, which is good, since other letters requiring a couple divisions (lots of monsters start with “D”, for example). Every token from the Monster Vault box, as well as the DM Kit, can be stored here, with plenty of room to spare for future expansion. My D&D Box has really been a game changer. 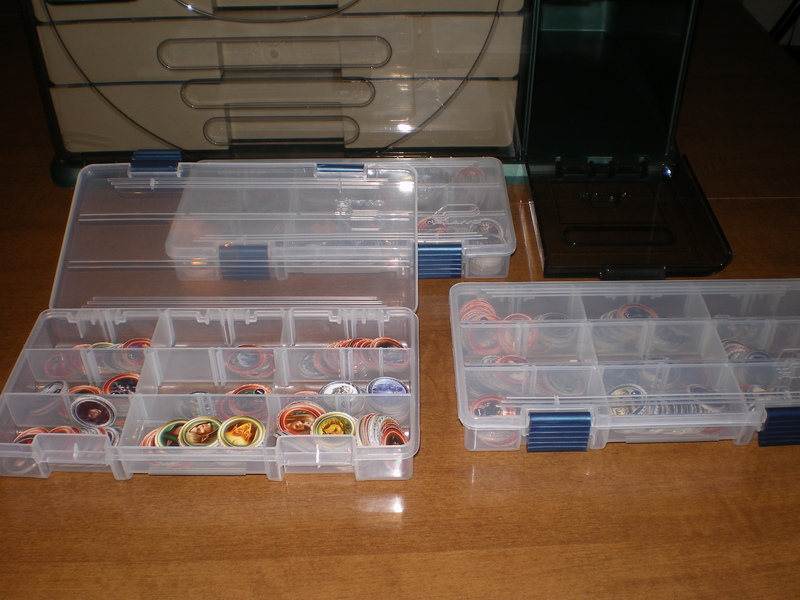 Before, I was using a combination of small plastic tubs and the Essentials boxes to keep everything together. It was a nightmare of inefficiency. Though the box was not cheap, by any means, it has been worth its weight in platinum pieces since it makes our games run much more smoothly. 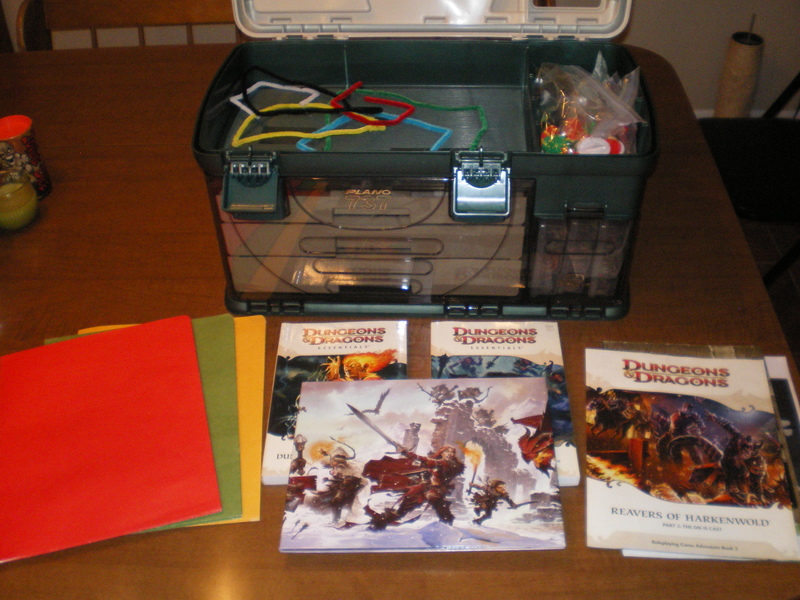 I highly recommend any DM check out fishing or even scrapbook supplies for a similar box. You will not be disappointed. My wife is a scrapbooker, so I’ve had plenty of access to useful tools and other stuff, but not yet a gaming box. I WILL be getting that Plano Model 737, thank you very much! This is a great article! Well written and informative pictures. Although I’m not a fan of Wal-Mart this box looks like the perfect addition to my portable gaming experience. I wonder if Plano sells this off their website. I run NERDTREK.com and am interested in obtaining the software (plug-in) you’re using for tablets (on swipe) on your site. I signed up for the beta test but haven’t heard back. Do you have any additional info on this? Finally, in regards to your last gaming session with your full group: make it epic (note that I’m using epic as the word is intended and not as in the new popular culture phrase). Make it a session that everyone will remember for years to come. Stand up, act out parts, play the characters, npcs, and monsters. Jump quickly from scene to scene and don’t waste time with the in between small stuff. You don’t have time with only 4 hours to role-play the entire shopping experience. Have pcs buy equipment or attend to other duties outside the session. Send them on one of those final missions like at the end of each star trek series. Watch those for inspiration! Good luck and remember to appreciate each moment with your group. Future sessions with smaller groups are possible. For years and years I ran solo games (DM and player only) and they were some of the best due to the amount of attention I could pay to the single character and craft all games to their liking/style. Npcs filled the roles of the party which helped me with role-playing and voices/accents. I bought a bunch of old MageKnight miniatures for cheap which I will be rebasing for use in my DnD adventures. I was Googling for storage options and found this website. What a great way to keep al your stuff together! I haven’t found this particular kind of fishing box here in The Netherlands, but I will keep looking out for something similar. This is a great idea! I’ve tried something similar in the past, but I’ve never put something so quality together. 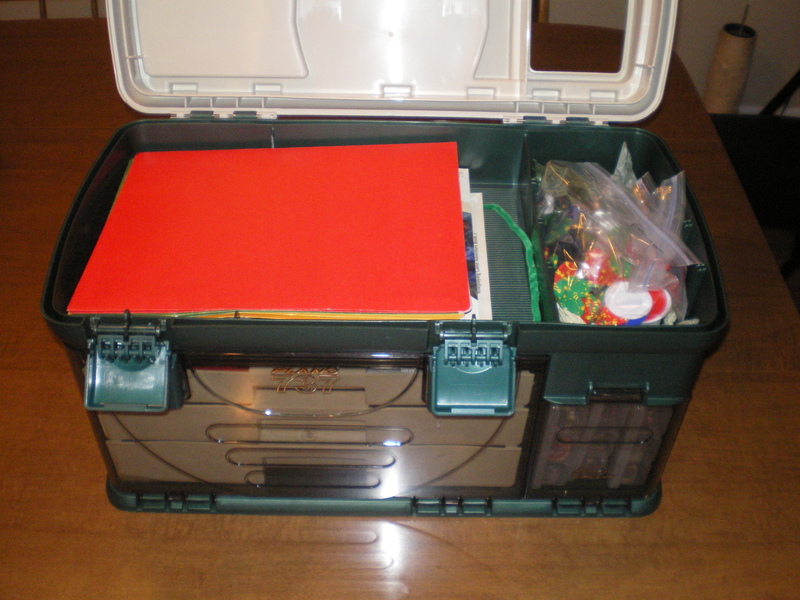 I got this exact toolbox from Santa when you first published this article. It’s a D&D staple. Love it. Are they that expensive now? I wouldn’t pay that much either. Go to a fishing or scrapbook store, I’m certain you can find something similar for a more reasonable price. Fishing stores in Australia have that model for between $130 and $150, but I will most certainly start scouring the sporting sections of Kmart and the like…wish me luck! I just got one! perfect. I got one the other day because of this article and it’s helped tremendously. I use a slightly different setup however. I took out the middle drawer, moved the bottom one to the middle slot, and then I store my books in the opening where the bottom drawer used to be. It works pretty well right now. Interesting. Maybe I should put something like this together. This is a really good idea and I grabbed myself one of these boxes on your recommendation. My question is – do you actually use this box right at the table? I only ask because it is BIG! Where I play I don’t think I will have the room to have it sitting next to me at the table. I think I will have a much smaller ‘session’ box that can sit next to me but keep this giant somewhere nearby so I can grab anything if i need it. It is indeed huge! We usually have a countertop or side table around when we play, and I usually keep the box there, a couple steps away. It does take up a lot of space, too much for the primary gaming table, as you have discovered. Nice article! I’m really tempted by this box now. Do you know if the three core 5e books will fit in the top section? Or, if you don’t play 5e, any chance you can give me the exact depth of that section? It’s a pricey item so I want to be sure. The three 5E books fit if you cut the small dividers out, which I did soon after I got the box. I just wanted to thank you for this idea. I picked up my own Plano and couldn’t be happier with it. Minis, dice, pencils, paper, books, cards — everything’s right at my fingertips. I keep the box within easy reach on a little side table when we game and it’s freed up my main table space for game notes, maps, and dice rolling. And when we’re done for the evening, packing it all up is a breeze. Again, thanks for the great tip! Is it big enough for core rulebooks for 5th edition? Does anyone know? Yes, it fits them just fine once you remove a small dividing panel. How did you remove the dividers from the top? Did it leave anything that can damage the books? Or was it a clean removal that left everything smooth and edges free? The cut was smooth, and I was able to remove almost everything. My books have not been damaged in any way I can tell. Can you fit a chessex small figures carrying case inside there?